Tony Alford saw the opportunity at Ohio State to develop from a running backs coach into a head coach under Urban Meyer, and that is one reason he took the running backs coach position with the Buckeyes. 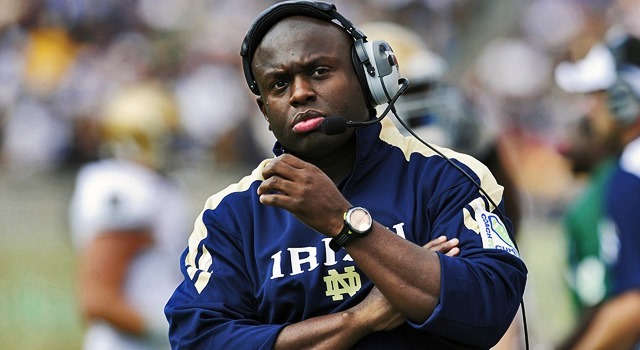 A Notre Dame RBs coach the last six years, Alford is taking over the OSU job today after Stan Drayton moved onto the NFL. Also a recruiting coordinator for the Fighting Irish, the Colorado State running back turned coach, hopes to learn under Meyer and develop into a head coach. His recruiting skills led Notre Dame to have the 6th best recruiting class in the country this year. He joins other Notre Dame coaches at Ohio State including Tim Horton and Ed Warinner. Alford disqualified claims that the move was driven by money as Notre Dame does not pay assistants as much as other schools. He is looking five years out and sees Ohio State as an important step to the next level of coaching. Alford will coach two running backs that he recruited for Notre Dame in Mike Weber and Ezekiel Elliott. He has had a little bit of a tough time leaving Notre Dame with reports of him calling some of the kids he recruited and crying during his final talks.